San Onofre Mountain lies near the center of Camp Pendleton, the huge Marine Corp base located along the Pacific Coast in northern San Diego County. I had driven by the base on Interstate 5 countless times, eyeing San Onofre Mtn with some envy. Only 5ft short of a P1K, it seemed one of those summits I'd never be able to reach. While persuing peakbagger.com one evening, I was surprised to see that Patrick O'Neill had been to it earlier this year with a good-sized party. Having just spent a few days with Patrick in the Mojave Desert, I was about to fire off an email to ask him how he managed it when I noticed that one of the party, David Comerzan, had left a TR with the key info I needed - John Isakson, an avid hiker who happens to work on the base. My email, then, bypassed the middleman and went directly to John who responded within a few days. He was planning to repeat the very hike in early January and welcomed me to join the party. Unfortunately this didn't work for me since I was in SoCal with the family for only a short three days before Christmas. John came right back with another invite for Dec 22, one of the three days I had available. After a weather check it was moved to Dec 24 since the 22nd was going to be a rainy one. One can't help but love someone so accomodating. Turns out John had two weeks off while the base was virtually shut down for the holidays. Mikey Sullivan had already signed up for the hike before I got involved and Mark McCormick came along at my invitation to give us a party of four. Three of us met at the Park n Ride at the junction of SR76 and I-15 at 6am, then carpooled in John's luxury king cab truck to Basilone Rd and I-5 where we met up with Mikey and drove onto the base. I was surprised to find that the entrance guard only checks for a valid driver's license without any check of the occupants or what we might be up to. Seems one can drive onto the base and could probably get away with hiking around all sorts of places (assuming they aren't in a Live Fire area or other restricted areas). I asked John what sort of trouble one would run into if caught out without authorization and it came down to "You'd probably get yelled at, a lecture and asked to leave." I'm not going to find out myself, mind you - better to just give John a call. We parked outside John's office at the School of Infantry off Basilone Rd, heading out on foot from there. We followed dirt/gravel roads west for about two miles, basically following along the flood zone of San Onofre Creek. We then turned abruptly left through the brush to follow a single track onto the Northwest Ridge of San Onofre whose summit at this point was a good 3.5mi to the southeast. It isn't the shortest or fastest route to the summit but it made for a better tour as it takes in some of the history experienced in the Combat Instructor and other courses taught here on the base. John, in fact, is responsible for much of the course work developed for the School of Infantry at Pendleton. The single track meets a wide firebreak higher up which we then followed for the remainder of the route to the summit, up and down over 8-9 significant hills (though none with significant prominence). There were several places where one could find various memorial crosses erected to honor the memory of fallen comrades, some of these for individual members, others collectively for regiments or companys. The mementos left included all sorts of personal items including Purple Crosses, insignias, and large quantities of alcohol, much of it left unconsumed. With John's moving narrative, one can't helped but be touched by the solemnity of it all. Other hills were the site of various training milestones - MMA belts earned and Combat Instructor completion. Most of this would have looked peculiar and un-noteworthy without John's explanations. We were just over three hours in reaching the antennae-topped summit of San Onofre Mtn. Clouds obscured much of what is otherwise a very fine view from the top, with most of the huge base visible from our perch. We took a short break here to eat some food and rest before deciding on which of several possible descents we could use. Mark had mentioned Horno Hill earlier, not really a note-worthy summit known to base personnel, but a named summit on the topo map nonetheless. John had not been to this nearby hill, about a mile to the south, and had no objection when I suggested we might pay it a visit. 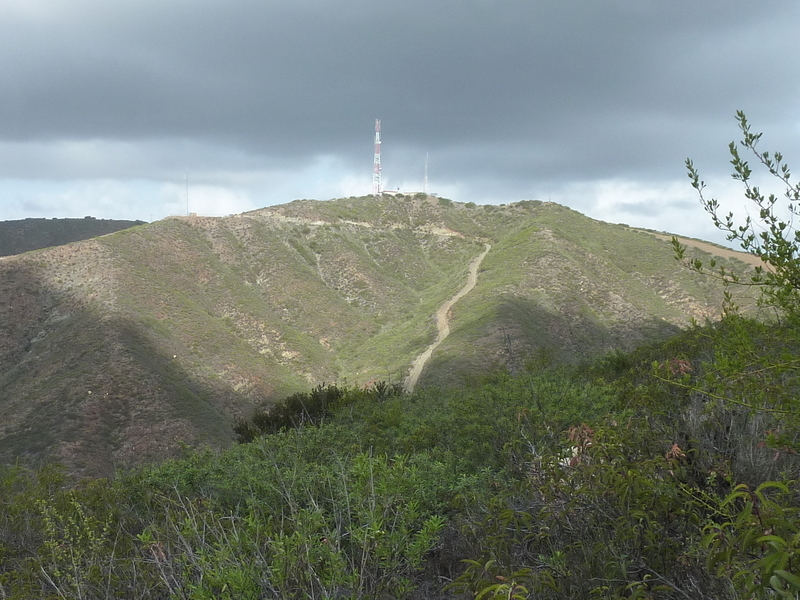 It does not have the wide firebreak running along the ridge as we had for San Onofre, but as it turns out there's what appears to be a use trail running up from the saddle with San Onofre. This saved us from what would otherwise have been an unpleasant bushwhack, taking only about 30min once we left the higher San Onofre summit. We went up to the highpoint and then down a short ways on the west side in search of a benchmark depicted on the map, but found nothing but some military refuse. We returned to the saddle and then dropped north down various roads segments to Camp Horno, about 2mi SE of our starting point along the dry San Onofre Creek and Basilone Rd. We went by the Gas Chamber where once a year the marines get tested with tear gas in an unpleasant exercise in which one must enter the building with gas masks on, remove them and sing the Marine Battle Hymn all the while one is dripping with mucous and other nastiness, then put the mask back on and clear it before leaving the building. Bushwhacking sounds way more fun by comparison. We passed by other training areas and obstacle courses before returning to the start not long after 12:30p. Mikey had one more peak up his sleeve, unnamed Peak 890ft about five miles to the north. He had found it on peakbagger.com and figured we ought to knock it off while we had the opportunity and John was happy to oblige. We drove north through more of the base in search of our lonely summit, finding a place to park at its base to the west. It was an easy enough bonus hike of just over a mile and not quite 700ft of gain. The summit had an old visual navigation marker and yet another small memorial found at its base with a view overlooking Camp Talega and the adjacent neighborhood of San Clemente.